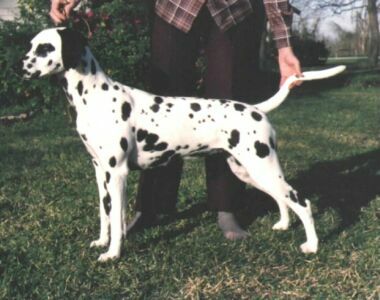 Whelped 10/12/91, Bungee is a Group winner, a Top Spot Obedience dog for her Novice title, and an all time Top Champion Producing Dam with 12 champions. Possessing a strong front with great shoulders, good rear, balanced movement, and a confident, fun loving personality, Bungee is everything we wanted in a Dal. Bungee awakened each morning with a big smile and was an avid tennis ball retrieving enthusiast all of her life. BAER bilateral, OFA fair, thyroid normal.